There were two marriages in our McLaughlin family with children of an Irish-born Patrick Carrigan. Two different Patrick Carrigans, that is. Both of them settled in the Skaneateles area after leaving their native land. Edward J. McLaughlin (1874-1933), son of Mary O'Hara and Dennis McLaughlin, married Mary Ellen Carrigan (1872-1931), daughter of Mary Jane O'Neill and Patrick Carrigan. Her mother was not related to the other O'Neills on our family tree, so far as I know, and was born in Massachusetts. Her father was born in County Tipperary, Ireland. Mary McLaughlin (1868-1918), Irish-born daughter of Cornelius "Neal" McLaughlin, left home and joined other relatives who had settled in Central New York. She married Thomas Carrigan (1860-1918), son of one of Skaneateles' most interesting characters, Patrick C. Carrigan, the self-anointed "Irish lord." PATRICK C. CARRIGAN, often identified by his first two initials, was born in 1829 in Ireland. There he married Mary Riley (1830-1875) and they had a daughter, Mary, in 1852, before they emigrated to the United States. He settled in an area of Skaneateles known as Hart Lot (or Skaneateles Junction), and initially was a farmer, though he became better known for his interest in the Skaneateles Lime Works, first as a partner, then as sole owner. The company was very successful for several years, making Carrigan a relatively wealthy man. He also was a vain, self-centered individual who referred to himself as an Irish lord and apparently used his wealth to impress the ladies. Meanwhile, his wife was busy giving him children. P. C. Carrigan had at least 14 children by Mary Riley Carrigan, and six of them died either in infancy or childhood. CARRIGAN'S PERSONAL LIFE became a mess in the 1870s and a legal battle over his will, after he died in 1895, was inevitable. Stories about the court cases do not make clear how Carrigan's first marriage ended. However, if Skaneateles marriage records are correct, and if the dates on Mary Riley Carrigan's tombstone at St. Mary's Cemetery, Skaneateles, are correct, then P. C. Carrigan's second marriage, to widow Catherine Ryan, took place several months before the first Mrs. Carrigan died. There is no mention in any of the stories about at divorce. What I did find is a news item from February, 1874, that the first Mrs. Carrigan, identified by the newspaper as the current Mrs. Carrigan, was badly burned when a kerosene lamp exploded. Six months later, on August 6, her husband remarried. And then, six months after that, almost a year to the day she was burned, the first Mrs. Carrigan died. I've checked several times, thinking perhaps Mary Riley Carrigan had died in 1874, not 1875, but it appears she was still alive when her husband wed Mrs. Ryan, who had HAD two children by her first husband. On May 23, 1879, an Auburn, NY, newspaper called The Evening Auburnian reported: "Patrick C. Carrigan, of Skaneateles Junction, is the happy father of his twenty-first child, a son." This child must have died within days of birth because there is no record of him elsewhere, not even at St. Mary's Cemetery. Including Mrs. Ryan's children, who may have been legally adopted by P. C. Carrigan, I can account for "only" seventeen children. Either Carrigan lost count, or four other of his children died at birth or soon thereafter. ONE THING'S for sure, Carrigan kept track of his children when he made out his will in 1891 and when he added a codicil two years later, which was 16 months before he died, in April 1895. For all practical purposes, Carrigan's second marriage had ended in 1886 with an agreement that would be disputed after his death. More upsetting to his heirs would be Carrigan's involvement with another widow, Mrs. Phebe (or Phoebe) Larder, who today is a bit of a mystery. Carrigan willed her his winter home in Satsuma, Florida, which included a stable and eight acres of orange groves. This was Carrigan's most valuable piece of property, though its estimated worth — between $12,000 and $15,000 — seems very small by today's standards. As often is the case, Carrigan wasn't as wealthy as his heirs thought. His will left just $200 each to two daughters, Mary Carrigan of Geneva, NY, and Mrs. Ellen Houser of Aurora, NY. His other daughters — Mrs. Margaret Power and Mrs. Julia McCullom of Skaneateles, and Mrs. Lizzie McPeak of Elbridge, NY — were excluded from the will. The remainder of the estate, which included a farm in Skaneateles Junction and the Skaneateles Lime Works, was given to his three sons who were named as executors — Michael Carrigan of Jordan, Thomas and Andrew J. Carrigan of Skaneateles. THE WILL was immediately contested. Mrs. McPeak, one of the daughters excluded from the will, filed suit through lawyer, M. F. Dillon of Skaneateles. And Mrs. Catherine Carrigan did the same through a Syracuse attorney, George H. Sears. It is claimed, however, that Mrs. Carrigan, who was Mrs. John Ryan, a widow, when she married Carrigan, had accepted $3,500 at the time of separation from her husband in lieu of dower rights, but this is denied. That figure, incidentally, was reported else where as $3,050, an odd amount, but one that was used by every other newspaper that followed the Mrs. Carrigan's lawsuit, which proved unsuccessful. Catherine Carrigan is not entitled to a dower interest in the estate of Patrick Carrigan, deceased, better known during his active lifetime as “The Irish Lord.” Justice McLennan has practically decided so in his disposition of a motion sustaining the demurrer entered to Catherine’s suit in the Supreme Court. “The Irish Lord” was a resident of Skaneateles and a very prosperous one, too. But prosperity did not bring happiness into the family. Carrigan said it was because of his wife’s unreasonable jealousy. How could he prevent all the ladies of the neighborhood from casting sheep’s eyes at him? On the other hand, Mrs. Carrigan complained of cruel and inhuman treatment. A suit for separation was brought by her in June, 1886, but it never came to trial, because Carrigan was as willing as his wife that a separation should be decreed. Papers were drawn up by which it was agreed that Mrs. Carrigan, in consideration of the sum of $3,050, was to waive all claim to the estate of her husband. On his part, “The Irish Lord” agreed that he would leave Catherine alone thereafter. This arrangement was carried out up to the time of Carrigan’s death without any misunderstanding so far as is known. AS FAR AS I've been able to determine, efforts by Carrigan's children to deny Mrs. Phoebe Larder's claim to the Florida property also were unsuccessful. The Skaneateles Free Press, in its story on May 24, 1895, described Mr. Larder as "a buxom English widow, with two children, many years the junior of Carrigan, who was 66 when he died." Mrs. Larder is said to have had great influence over Carrigan, and acted as his housekeeper. He lavished money upon her, took her on a tour to England and Ireland, furnished her finery and a fine horse and carriage and willed her the life use of his Florida orange grove. The objections also say that Patrick was weak and unsound of mind and memory, and that he was incapacitated for the transaction of his business affairs. What isn't clear is when Carrigan became involved with Phoebe Larder, who appears to be the reason his net worth, when he died, was so much less than his heirs expected. The key is that line in the above newspaper excerpt: "He lavished money upon her (Mrs. Larder), took her on a tour of England and Ireland, furnished her finery, etc." According to a story in the Syracuse Post-Standard (July 19, 1898), one reason he cut himself loose from his second wife was that "Mr. Carrigan, who had determined to see something of the world before he died, spent and transferred a large part of his estate." EVENTUALLY the matter of the Skaneateles portion of the estate was settled when the five daughters agreed to split one-third of the estate, leaving two-thirds to be divided among their three brothers. The property apparently was sold shortly thereafter. Ironically, considering how the proceeds were divided, it appears Carrigan's second wife, with a payoff of either $3,050 or $3,500, may have benefitted more than any of the heirs, except Phoebe Larder, who, in 1898 she married Alfred Yoran in Fayetteville, NY, or so it was reported in the Skaneateles Free Press. Interestingly, Alice Carrigan, a daughter of Michael Carrigan, one of P. C. Carrigan's sons, married William Larder. And I believe it's the same William Larder whose mother inherited her grandfather's Florida orange grove. P. C. Carrigan is buried next to his first wife, Mary Riley Carrigan (1830-1875), in St. Mary's Cemetery, Skaneateles. Catherine Ryan Carrigan, who died in 1910, also is buried in the family plot. Children of Patrick C. Carrigan, "The Irish Lord"
1. Mary Carrigan (1852- ). Born in Ireland. In stories about her father's will she was identified as being a resident of Geneva, NY. 2. Michael Carrigan (1853-1936) m. Catherine Quinlan (1855-1915). Both born in Ireland. He was a railroad man for 40 years, retiring in 1923. Among her survivors: a brother, John Quinlan of Skaneateles Junction, and a sister, Miss Julia Quinland of Skaneateles. James Murphy (1904- ) was a major in the US Army Medical Corps during World War II. Seeley Wright (1905-1960) served in the Army Air Force during WW2. 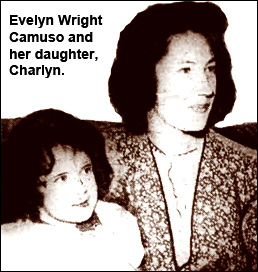 Evelyn Wright (1908-1991) m. Charles Camuso (1908-1978). 2nd husband: Alfred John Kreischer (1905-1984). She retired as an assistant chief operator after 30 years at New York Telephone. She died in St. Augustine, Florida. Charlyn Camuso (1935- ) m. James H. McCarthy (1934- ). He is a retired railroad accountant. They live in West Grove, PA.
Kevin James McCarthy (1957- ) m. Angela Cola; Honey Brook, PA.
Christopher Michael McCarthy (1959- ) m. Heather ? ; Manchester, MI. Maria Elaina McCarthy (1961- ) m. Richard Michael Foss; Coatesville, PA.
Colleen Anne McCarthy (1962- ) m. Walter Fries; Glen Mills, PA.
Lynn Ann McCarthy (1964- ) m. Michael Welch; Downingtown, PA.
• Patrick Carrigan (1885-1927) He was an employe of the Brown-Lipe-Chapin Company and a member of the fraternal order of Red Men and Eagles. • Daniel J. Carrigan (1888-1934) m. Mary Mullin. He was employed by the New York Central Railroad for 25 years. William J. Carrigan (1918-1998) m. Bertha ? ?, Baldwinsville, NY. Donald E. Carrigan (1928-2011) m. Delores Palladino. He retired from Bristol Laboratories in 1987 after 36 years. Rhonda Carrigan m. Richard Fults, East Syracuse. Jerrold Carrigan m. Carol ? ?, Wilson, NC. Ronald Carrigan m. Lisa ?? 7. Margaret Carrigan (1861-1939) m. Michael Powers (1857-1931). Powers, an employe of the Skaneateles Railroad Company for 30 years, died after suffering a heart attack while working as a night watchman in the railroad company's engine room. 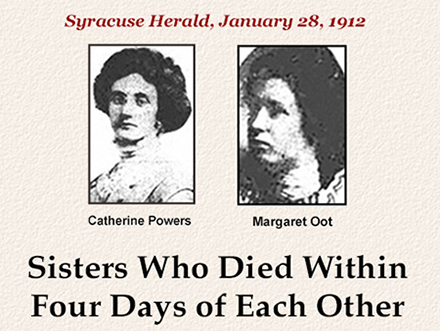 Among his survivors: a brother, Thomas F. Powers of Auburn, and a sister, Mrs. Catherine O’Hara of Skaneateles Falls. Judith A. Fix (1940-2009) m. Thomas Arendt. She taught second grade at Lakeshore Road Elementary in the North Syracuse School District. Adam W. Oot (1918-1987) m. Jeanne ?? (1924-2008). He lived in Westvale NY, and retired as a foreman for General Electric Co., after 35 years. He was a veteran of World War II. She was an avid artist, employed as a chemist and later at David Florist in Syracuse. Mary Anne Oot m. Lee Sapiro, Hudson, MA. Michael Oot m. Loretta ? ?, San Antonio, TX. • Catherine Powers (1887-1912) Newspaper story below. • Thomas N. Powers (1892-1912) Thomas Powers drowned in the Oswego Canal on October 29, 1912. He apparently slipped into the canal while he was walking to the home of his brother-in-law, Adam J. Oot. He took a detour to Long Branch, just north of Onondaga Lake, to view an area that had recently been devastated by a tornado, a rare occurrence in Central New York. 9. Julia Carrigan (1864-1941) m. Alexander McCollum (1857-1932). • John P. Carrigan (1896- ) m. Esther Boyle. He was founder and president of the accounting firm of Carrigan, Boltger, Landry & Scott of Syracuse. He served in the Army in World War 1 and was wounded during fighting in the Argonne Forest. • Andrew Francis Carrigan (1899-1915). Better known by his middle name, Francis Carrigan died in a spectacular and tragic automobile accident just south of Auburn, NY. Edward F. Hayes (1909- )was a guard at Jamesville Penitentiary. Edwena F. Hayes (1918- ) was a teacher at Oriskany Central School. • Gertrude Delaney (1890- ) m. M. Wallace Sullivan. She taught school at Marcellus Falls before their marriage. He was a veterinarian for nearly 50 years in the Marcellus area, and also served ten years as the village's police justice before he retired and moved with his wife to Orange City, Florida. Dr. Edward M. Sullivan and his wife lived in Portland, Maine; they had three daughters. John W. Sullivan was director of customer relations for Eastern Airlines. He and his wife had six children. • Marie Delaney (1895- ) m. Benjamin M. Griffin (1894- ) They were married at St. Mary's Church, Skaneateles, but lived in Camillus. Their marriage makes another connection with the Major family. Anna Major married Michael J. O'Hara, whose brother, James, married Catherine Griffin. She was, an aunt of Benjamin Griffin, who, according to the 1900 U.S. Census lived with the O'Hara family as a child. • Genevieve Delaney (1903- ) m. Willard N. Smith. Smith was a teacher. • Helen Delaney (1907-1948) m. William P. James (1910-1995) She was a graduate of Elbridge High School and Syracuse City Normal School. Before her marriage she taught at Split Rock High School. She is buried at St. Mary's Cemetery, Skaneateles. James was a graduate of Central City Business Institute and was employed by Crucible Steel Company. After his wife's death he remarried, to Phyllis ?? • Loretta Delaney (1909- ) m. A. Barrett Davidson. She taught at Camillus High School, he taught at East Syracuse. Mary Ellen Carrigan, who married Edward J. McLaughlin, was daughter of Mary Jane O'Neill and Patrick Carrigan. Her mother, a Massachusetts native, was not related to the other O'Neills on our family tree, so far as I know. Her father was born in County Tipperary, Ireland, and after he arrived in Skaneateles was likely known as The Other Patrick Carrigan, for he lived in the shadow of Patrick C. Carrigan, who called himself "the Irish lord." 1. Rosanna Carrigan (1869-1919) m. James Gannon (1869-1941). They lived for awhile in Skaneateles Falls, then moved to Syracuse. • Regina C. Gannon (1904- ). According to the 1940 U.S. Census, she was a maid living at the home of her employer, Neil Crowley, 1240 Court Street, Syracuse. 6. Katherine Carrigan (1882-1941) She lived for awhile with her sister Mary Ellen, later lived with her nephew, Paul McLaughlin, until her death. These were the last conscious words uttered by Miss Catherine L. Powers, 25 years old, who died at 12:30 o’clock on Friday morning at the home of her sister, Mrs. John P. Ryan, 424 Ulster Street. The “Margaret” who was present in Miss Powers’ last thoughts was her sister, Mrs. Oot, wife of Rapid Transit Inspector Adam J. Oot, who had died on Monday at the City Hospital of diphtheria, but of whose death Miss Powers passed away in ignorance. Mrs. Oot was taken to the City Hospital on January 19, suffering from diphtheria, and died there on Monday morning at 3 o’clock. On the same day when Mrs. Oot was taken to the hospital, her sister, Miss Catherine Powers, was seized with what was at first believed to be a hard cold, but afterward turned out to be pneumonia. On account of Miss Powers’ serious condition, the news of her sister’s death was kept from her and she was allowed to believe that Mrs. Oot was improving. In her conscious moments the young woman’s thoughts were always with her sister sister and her constant inquiry was as to Margaret’s progress. Other sisters, Mrs. Ryan and Miss Frances Powers, who watched beside the sick girl’s bedside, did not dare betray their emotion when they received the news of Mrs. Oot’s death, or when on the following day, a prayer was said on the veranda outside the diphtheria pavillion of the City Hospital over a plain, covered coffin into which no eye might look. For the sake of the living sister they hid their grief for the dead. But their precautions were in vain. A little after midnight on Friday the younger sister when to join the older, whom she had loved so dearly, and whose affection had filled her thoughts to the exclusion of self. And in the little Catholic cemetery at Skaneateles the two will lie side by side. Mrs. Oot was 31 years old. She is survived by her husband and five little children, as well as by her two sisters,, Mrs. John P. Ryan and Miss Frances Powers, and by two brothers, Thomas and Leo Powers. Incredibly, another Powers sibling would die that year. Thomas Powers drowned in the Oswego Canal on October 29, 1912. He apparently slipped into the canal while walking to the home of his brother-in-law, Adam J. Oot. He took a detour to Long Branch, north of Onondaga Lake, to view an area recently devastated by a tornado, a rare occurrence in Central New York. Fire caused by a blowtorch drove seven persons, including a sick child, from a two-family home at 138 Dale Street, shortly after 9 o’clock this morning. The blowtorch was being used by Max Ripple, the landlord, who had been painting the exterior of the frame dwelling. Flames went through a rear wall into a partition. Mrs. Bessie Wright, her son, Seeley Wright; her daughter, Mrs. Evelyn Camuso, and her granddaughter, Carolyn Camuso, 4, were driven out of the first-story apartment by smoke. Carolyn had been sick in bed for two weeks and had to be carried out by her mother. Residents of the second-story flat who were forced to flee were Mrs John Hines and her children, Patricia, 14, and Ronald, 6. Engine companies 9 and 15 and Truck 2 went to the scene in response to a telephone alarm of fire. The exterior of the house, ceilings, partitions and the attick were damaged extensively by the flames. Damage to furnishings was slight, however. Barbara Oot Gerthoffer, 80, formerly of Minoa, died Monday at Jackson Memorial Hospital, Zephyrhills, Fla.
Mrs. Gerthoffer was born in Syracuse and lived in Minoa before moving to Florida 18 years ago. Surviving are her husband. Earl; a daughter, Mrs. John Fitzgibbons of East Haven, Conn.; four foster children, Kathryn LaMourey of Watertown, Shirley Wormouth of Morrisville, Robert Kravetz of East Syracuse and John Corey of Utica; a sister, Ann Fix of North Syracuse; a brother, Adam Oot of Camillus; 14 grandchildren; and 11 great-grandchildren. Burial: St. Mary's Cemetery, Minoa. Anne F. Oot Fix, 85, formerly of Sandra Lane, North Syracuse, died Wednesday at St. Joseph's Hospital after a long illness. A native of Syracuse, Mrs. Fix lived most of her life in North Syracuse. She had operated Ma & Pa's Inn in North Syracuse. Mrs. Fix was a 1931 graduate of the Syracuse School of Nursing. Her husband, Oswald K., died in 1969. Mrs. Fix was a communicant of St. Rose of Lima Church, North Syracuse. Surviving are a son, Richard A. of North Syracuse; a daughter, Judith A. Arendt of North Syracuse; two grandchildren; and four great-grandchildren.